The inheritance of an estate can lead to argument and family tension. Two estranged middle aged brothers, one, a policeman who sacrificed a career to look after his father and the other, a successful surgeon who followed his ambitions, must come to an agreement over the sale of the heirlooms of an estate that has been locked away for years. 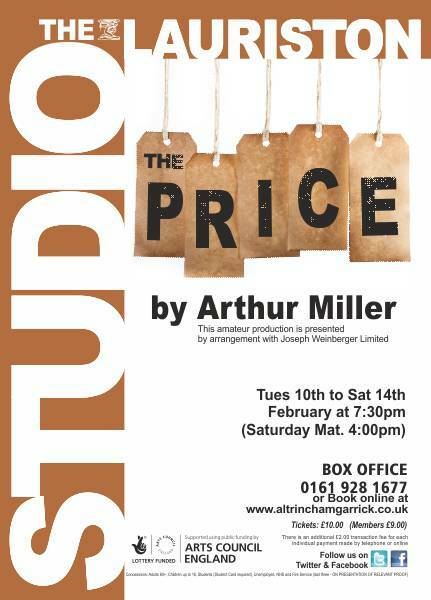 “The Price” of the title is the legacy of the past and is one of the most entertaining plays that Miller has written. The intensive conversation is both heartbreaking and emotional but beautifully broken by moments of sublime comedy. This award winning play by the author of The Crucible, A View from the Bridge and Death of a Salesman promises a truly classic play in the Lauriston studio. I am really rather fond of the works of Arthur Miller, but, like most people, only really know his more performed works in any real depth; plays like The Crucible, All My Sons, A View From The Bridge and Death Of A Salesman. But why do those plays seem to get preference over his other works, some of which, like last night’s offering at Altrincham Garrick are rarely performed and indeed mostly unknown. I don’t know the answer to that question, and after watching the play last night, it really ought to be done more. It’s a very good play. The Price tells the story of two brothers, who are effectively estranged not having spoken to each other for the past eleven years and their feuds and bitterness go back even further. However, the apartment block where they and their father lived is being torn down, and so their father’s antique and expensive furniture which has been being stored there for several years now needs to be sold. The price in the title though doesn’t just mean the actual monetary value put on the furniture by the dealer, it has much more to do with the price we pay for the choices we make in our lives. Each of the two brothers made certain choices; one staying at home to look after his ailing father, and then becoming a policeman, and sacrificing what could have been a brilliant career in science; whilst the other brother was more selfish and went after that career, becoming a rich and well-respected doctor, but losing his wife and his children and his self respect in the process. The brothers meet back at the apartment for the first time since their estrangement, and naturally there are tensions and more things are left unsaid than are said, but it is clear that they both want to come together again, but neither really knows how. In amongst all of this is the furniture dealer who acts as a sort of arbiter between the two brothers, a moral conscience to them both, but in the end, despite his best efforts, even he cannot reconcile the two. But one short meeting between them after so many years of anger, regret, jealousy and perhaps even hatred, is not enough to bridge the gap between them. The play was directed by John Chidgey, who obviously has a deep understanding of both the play and the playwright. It was sensitively directed and had a very human, real feel to the play, which is sometimes difficult to achieve with Miller’s declamatory wordy writing. The set looked very authentic in the main, and was well designed. Lots of furniture of all descriptions scattered around the three corners of the stage, some under cloth and some still on show. I liked the skylight very much. The central table though did not fit the description in the text, and when the cover was lifted looked cheap and shabby. Maybe the cover should have been lifted from the upstage end, not visible to the audience? The same goes for the harp, which clearly was in perfect condition and did not have a crack in the sound board. However, turning the harp the other way, out of the audience’s view solves this problem quite easily. The costumes were also very good, but Victor’s policeman’s uniform looked far too new and straight out of the wrapper, even his shows looked like he was wearing them for the first time; despite his comments to the contrary. The protagonist in the play is Victor, the police sergeant brother. I really loved his performance. A truly believable world-weary NYPD cop nearing retirement carrying his ‘baggage’ but never really complaining, until forced into doing so. His accent was spot-on, and despite his given status as a police sergeant, he becomes throughout the play the lowest status character, first by his rather over-powering, money-grabbing lush of a wife, then more subtly and cleverly by the dealer, and then finally by direct confrontation and verbal bombardment by his brother. He played all of this with seeming ease and great aplomb and was a joy to watch. He was Bryn Thomas. Playing against him was Richard Salis as the furniture dealer. This character is possibly the hardest to find, since Miller is very specific about him. He is 89 years old, he is a Russian Jewish immigrant who has travelled a lot before coming to America and has had a stint in the British Navy. With all of this given by the playwright, it’s not an easy role to fill. But Mr. Salis lived up to this challenge and gave a truly sparkly performance. I am not sure whether or not the accent was correct; and to be honest, a huge amount of research would be necessary to try and find an authentic accent for this character, but that didn’t matter nor did it put me off his performance. His accent was constant throughout as was his characterisation and he found just the right nuances of interpretation within the text to make his lines count every time. Victor’s brother, Walter was played by Steve Williamson. A very brave try I thought here. He appears for the first time in the second act and enters with bravura to a much needed pace change; his brusqueness and arrogance were indeed nicely placed, but he pitched his voice too loud in comparison with the other cast members and was just a little too square-shouldered for me to really believe him 100%. I think, with this being the first night he may well have been a little nervous, and just needed to relax more into the role and to let the role become him rather than the other way around. Obviously a seasoned actor who knows the score, so it is more than probably just that; relax and enjoy the role, don’t fight or force it. Finally the forth cast member is Victor’s wife, Esther, played by Celia Bonner. There is a hint in the script very early on that she is rather fond of the alcohol to get her through the days, and with this in mind, her rather vitriolic ripostes and money-grabbing materialism make sense. Without it, and the characterisation becomes somewhat bland. Miller has obviously written her into the script for a reason; he never simply has characters just for the sake of it; nor is his very wordy dialogue just that… every word has been carefully thought over and every sentence makes the one before it fuller and more meaningful. Therefore we have to take this on board when looking at the character and how she fits into not just the play, but the entire story. For my money, it didn’t quite hit the mark on this occasion. Without her, then act one would simply last forever with no change in dynamic at all, but with her, then it should have provided needed relief from the word-heavy and languorous duologues and in the second act a foil and arbiter like the dealer, who has now gone into the bedroom to lie down, was for the two brothers earlier. It is the hardest of the four roles to place, and Ms. Bonner was indeed good, but her role was underplayed. I understand the director was wanting realism and truth in the characters, but what he perhaps forgot is that this play was written at a time when realism in acting was unheard of, and Esther needs to be just a little more verbose and jittery in order for there to be the changes in pace and dynamic needed to stop the play becoming very self-obsessed and inwardly spiralling. I keep mentioning pace, don’t I? The play can be in danger of coming to a complete stop because of the very long speeches and wordiness of the text, and director John Chidgey did much to stop this from happening, but I still feel more could have been achieved in regard to Esther’s character. The play ran at just shy of 2 hours 40 minutes including interval, which I would suggest is just a little long. Also I would say that a 7pm start rather than 7:30pm is better. The Price is not an easy play by any means, and that is probably why even the big professional companies fight shy of it; and so to see such a ‘professional’ production of this play done by those whose jobs are elsewhere and give up their time freely to act just for the sheer pleasure of doing so was both extremely gratifying and magnificent. It really is a very worthy production, so go to Altrincham Garrick and see The Price whatever the price!